Copyright law's default settings inhibit sharing and adaptation of creative works even though new digital technologies greatly enhance individuals' capacity to engage in creative conversation. Creative Commons licenses enable a form of conversational copyright through which creators share their works, primarily over the Internet, while asserting some limitation on user's right with respect to works in the licensed commons. 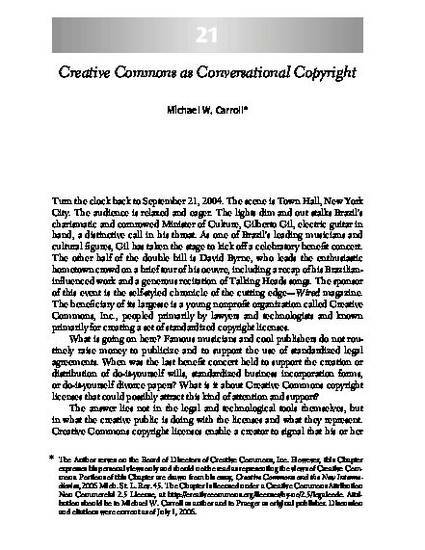 More specifically, this chapter explains the problems in copyright law to which Creative Commons licenses respond, the methods chosen, and why the machine-readable and public aspects of the licenses are specific examples of a more general phenomenon in digital copyright law that will grow in importance in the coming years.